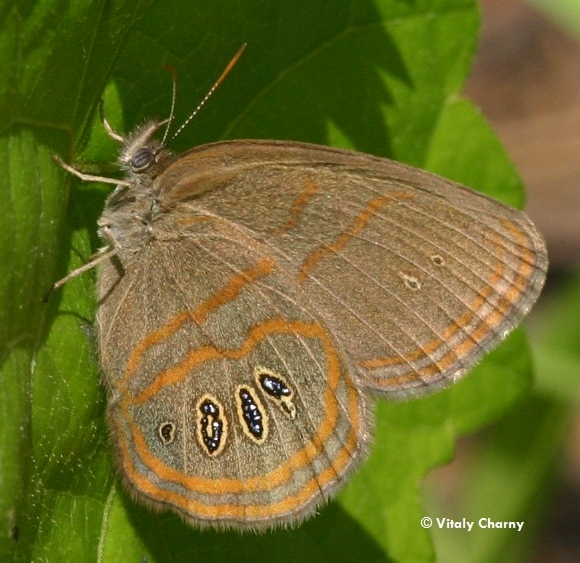 Identification: Upperside is brown with no markings. Underside of hindwing has a row of elongated submarginal eyespots which are encircled by a red line. Wing Span: 1 7/16 - 1 15/16 inches (3.7 - 4.9 cm). Life History: Adults have a slow, bobbing flight and rest often. Males patrol low over vegetation to find females. Eggs are laid singly on host plants; caterpillars eat leaves. Fourth-stage caterpillars hibernate. Flight: One brood from June-July in New Jersey; two broods from April-September in most of the range; many broods through most of the year in Florida. Caterpillar Hosts: Probably sedges (Cyperaceae). Habitat: Grassy openings in sandy pinewoods or pine barrens. Range: Southeastern United States from southern Virginia south along the Atlantic Coast to the Florida Keys, west to southeastern Oklahoma and southeastern Texas. Management Needs: Depends on fire succession habitats. Note: It has been determined that this species actually consists of two separate species, Neonympha areolata and N. helicta. Future revisions of this page will take this into account.